Few aspects of a person’s appearance make as noticeable an impression as a brilliantly bright smile. While your teeth may start off pearly white, a lifetime of consuming enamel staining foods and drinks can slowly rob your smile of a little of its luster. However, thanks to a number of teeth whitening products now on the market, it has never been easier to remove stains from darkened teeth. While the majority of over-the-counter whitening products are safe to use, they do possess the potential for causing side effects when used incorrectly or abused. To make sure your effort at do-it-yourself whitening ends safely, you should keep in the mind the following safety tips designed to keep your teeth and gums healthy and strong. Before you being any whitening regimen, you need first to undergo a professional cleaning and consultation about your oral health. Having your teeth cleaned could restore some of the luster to your smile by itself, and by removing any built up plaque or tartar, you increase the effectiveness of any whitening product you may use. Undergoing an oral exam also provides Dr. Kirchmeier an opportunity to look for any cavities or signs of gum disease that may need to be treated prior to beginning a whitening regimen. If your gums show signs of inflammation, for example, you might need to postpone whitening until they have healed. You can also take the opportunity to ask Dr. Kirchmeier for a recommendation of a whitening product during the appointment. The majority of home whitening products contain some type of peroxide, usually carbamide peroxide, in different concentrations that fall somewhere between 10 to 20 percent. When selecting a product, consider purchasing a whitening product that contains a mid-range bleaching agent, one that isn’t the highest or lowest concentration, until you know how your teeth or gums will react to the peroxide. You should also look for the American Dental Association seal of approval on any product you consider purchasing. The seal indicates that the product has undergone rigorous safety testing. When applying strong chemicals to your teeth, more is rarely better. Leaving whitening strips or gels on your teeth for longer than the directions state or using a product more often than directed won’t help improve the color of your smile more quickly, and could actually damage the health of your teeth’s enamel and cause gum inflammation. Most whitening products take several weeks before they make a noticeable difference on tooth color. Don’t expect to see immediate results when starting a whitening regimen, and try to remain patient as the weeks go by. You may also need to try a number of brands until you find one that best suits your teeth whitening needs. Tooth sensitivity occurs when the gum line begins to pull back from the base of a tooth, allowing hot or cold stimuli to irritate the never center of a tooth. The peroxide used in teeth whitening products can make mildly sensitive teeth even more painful when stimulated by hot or cold foods and drinks. If you use whitening trays that don’t properly fit your mouth, they can begin to irritate the gum tissue and cause inflammation to occur. If you notice your teeth becoming more sensitive or gums becoming red and swollen, you should immediately stop using any whitening product. 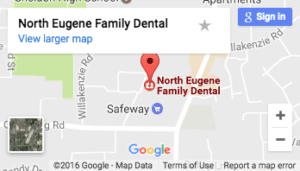 Schedule a whitening consultation today with Dr. Kirchmeier and the rest of our staff at North Eugene Family Dental by calling 541-343-5512 or click here.